After ninety minutes of watching Into The Wild, I fell completely for Christopher McCandless, the 22-year-old who gave away all his money and headed out for a life on the road. It took that long because up until that point in the two-and-a-half hour film I wasn’t quite sure where we were going. Now, going nowhere in a book is okay. That’s what books are, emotional explorations of character and identity. In a film, though, that same exploration can be death. A film, no matter how good the acting (and here, the acting is phenomenal – but I’ll get back to that), is about the action, what the characters are doing. 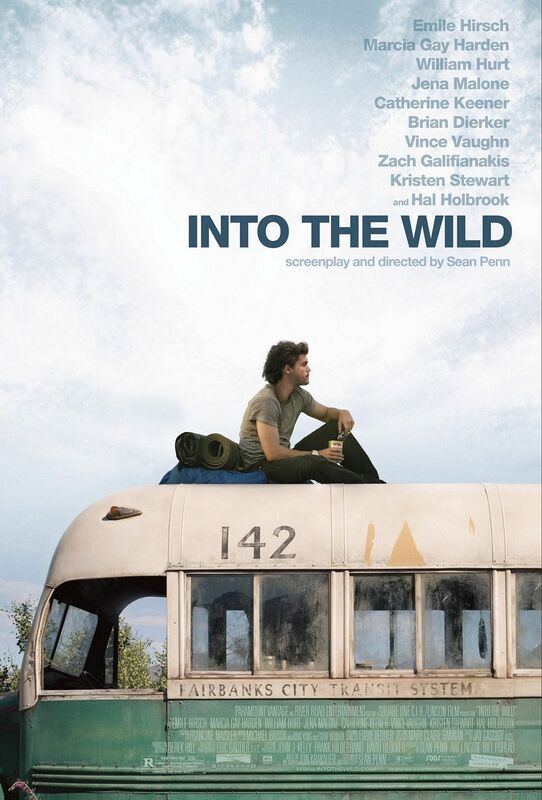 With Into The Wild, Sean Penn (who directs and adapts the screenplay from Jon Krakauer’s 1997 book) takes the true story of Christopher Johnson McCandless (Emile Hirsch), an Emery graduate who rejected all forms of materialism and took on the name “Alexander Supertramp” to hitchhike around the country, and translates it into an episodic tale of narrated self-discovery and the pursuit of freedom. The film is divided into sections, cross cutting between Alex living in Alaska (his ultimate destination) and the road trip he took to get there, including flashbacks to his childhood and home life. And this is why it took me so long to really embrace McCandless and what he was trying to do. It isn’t until we’re well into the film that Penn stops relying on narration (either McCandless himself or his sister) and begins to use the visual medium for what it is. When McCandless ends up in Los Angeles and sees (key word) the life he could have had, we begin to understand what he’s given up and why. Until that point, we’ve only beentold what’s going on inside his head. If I wanted that, I would have read the book. Once Penn makes that breakthrough, though, there’s no stopping him. We get early childhood memories performed before our eyes which go a lot further to explain McCandless’ fascination with the open road than anything else. We also start to get more of his interaction with other people. Earlier, when he was working for Wayne Westerburg (Vince Vaughn), we were never given enough to understand why these two hit it off so well, so we don’t get why either of them develop the attachment they do. On the other hand, McCandless’ time with a pair of traveling hippies, again, provides insight in much more detail than the voice-overs could ever provide. By the time Alex has teamed up with Ron Franz (Hal Holbrook) we are at last given some true moments where McCandless’ character is revealed by how Franz reacts to him by what he says himself. At last, we had a movie. With all that said, Penn’s visual style is remarkable. His use of extended metaphor (McCandless is often seen eating an apple and there is a proliferation of dual jet trails from passing planes) is nice and he really captures the beauty of what McCandless sees in the landscape of America. Additionally, he understands how to use an actor to the best of their ability. This film is a prime example of what happens when you put talent in small roles. William Hurt and Marcia Gay Harden play the McCandless parents, roles which could have been filled by central casting for the amount of screen time they take up. Yet, with Harden and Hurt, what could have been stereotyped dysfunction becomes nuanced pathos. And Catherine Keener (I will admit the bias here, I don’t normally like her) as a hippie with motherly longing, is amazing. She fills what could have been a static role with so much depth and longing there is a brief moment where you’d rather follow her than the boy. Which brings me to the boy himself. Emile Hirsch was tapped to play McCandless and does so spectacularly. Even when I wasn’t caught up in the story, his performance had me riveted. Honestly, I would have been disappointed had Penn not pulled it out because it would have been a disservice to the work of the amazing cast. But at the end, he does pull it out. He gives us a full feature which involves deep character transformation and some interesting musings on the nature of happiness – and the difference between being alone and being lonely. When the lights come up (please stay until the credits start rolling – there are some facts on the screen which need to be read) if you don’t want to turn to your companion and hug them just for sharing this with you, then, quite possibly, you have missed the point altogether.